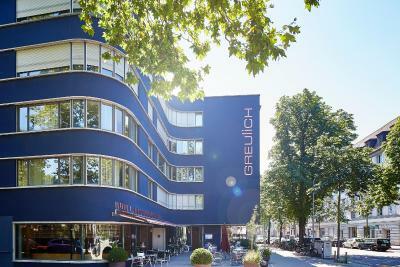 Lock in a great price for Greulich Design & Lifestyle Hotel – rated 8.8 by recent guests! 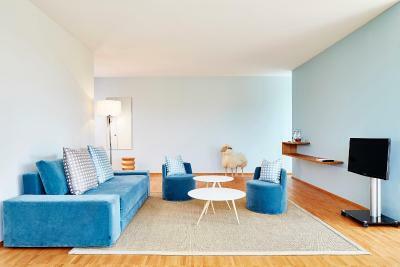 Nice local location and feel, but still pretty close to the city center of Zurich. 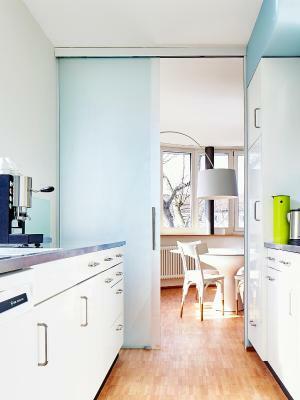 Hip yet friendly feel and good value for the money in Zurich. It was a very fashionable, trendy, design-minded hotel, with very cool furnishings and decor, but the bathroom set up was tricky to navigate. Very good deal for the money. Previous visitor. Convenient location for my needs. Relaxed atmosphere. Staff very helpful. Good breakfast. Quiet. The suite was excellent for the family as we could hang out in the living area when the kiddo went to bed. Good kitchen and fridge. The kiddo loved the low furniture. The staff was super friendly and helpful. The staff is super friendly and made me feel welcomed from the start. 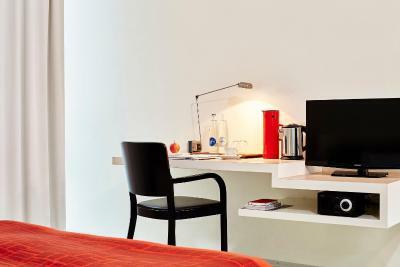 The rooms are large with a very comfy bed and a separate sitting area with desk and TV. No a/c but that did not bother me in early September. The breakfast was really good, if a bit expensive. The rooms that face the outside courtyard were very quiet. 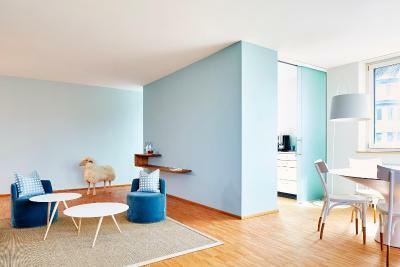 A very nice and spacious apartment style hotel. The staff are friendly. Laura has done a very good job making sure we had a pleasant stay. Highly recommended and will come back in the future. Wonderful staff and great patio and lounge. Will definitely stay here again this next time I'm in Zurich! 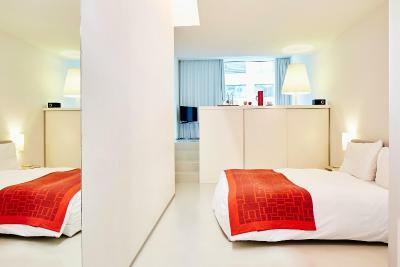 Amazing and spacious accommodation! Well equipped kitchen . Very friendly and courteous staff. Greulich Design & Lifestyle Hotel This rating is a reflection of how the property compares to the industry standard when it comes to price, facilities and services available. It's based on a self-evaluation by the property. Use this rating to help choose your stay! 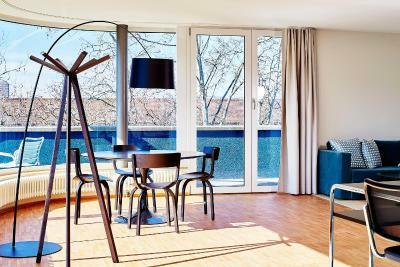 Greulich Design & Lifestyle Hotel welcomes its guests in a strikingly modern building with a straight interior design yet offering a warm and elegant atmosphere. The Café Herman's Wohnzimmer offers a bar and a terrace and is a meeting point for guests and locals. Guests can enjoy snacks and take-away options in a lively and relaxed atmosphere. The cigar lounge is an ideal place to end the day in style before your bright and airy room welcomes you for a peaceful night' rest. Aussersihl is a great choice for travelers interested in city trips, scenery and walking. 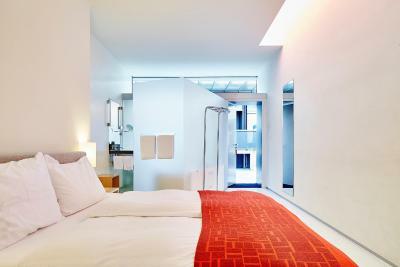 When would you like to stay at Greulich Design & Lifestyle Hotel? 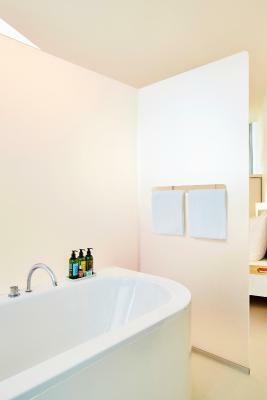 This room is decorated with white colors, and is in a peaceful part of the hotel. Please note that extra beds and cribs are not available in this room type. 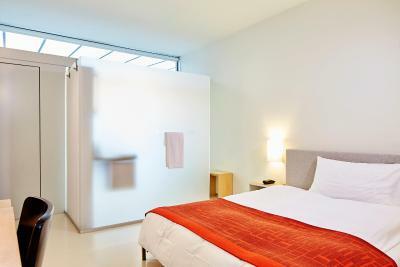 This room features a king bed, a large living area, a spacious bathroom with a shower, a flat-screen TV and a work desk. The suite has a large living room with large table, sofa bed and kitchenette. 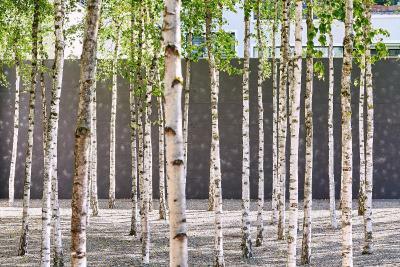 This small room faces the quiet courtyard of the hotel which is right next to a birch grove. 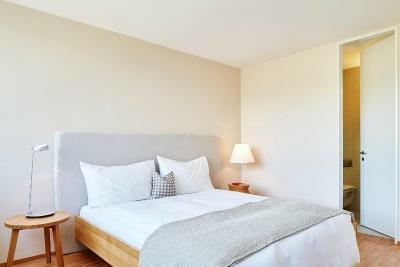 All rooms are equipped with wireless internet, a flat-screen TV, a radio and a safe. Further amenities include a yoga mat, mineral water, tea and fruits. 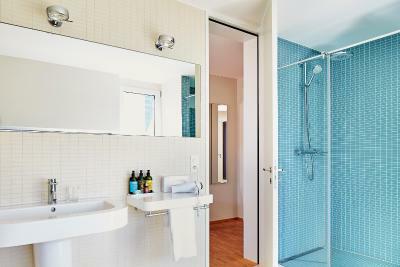 The bathroom comes with shower, hairdryer, and l'Occitane care products. 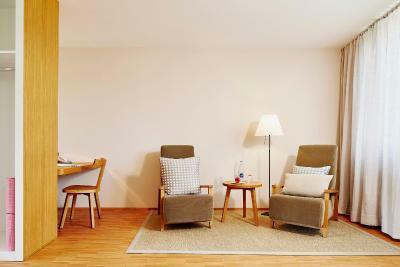 This apartment features cable TV, sitting area and sofa. Hotel surroundings – This neighborhood is a great choice for travelers interested in city trips, scenery and walking – Check location Great location - show map Guests loved walking around the neighborhood! House Rules Greulich Design & Lifestyle Hotel takes special requests – add in the next step! 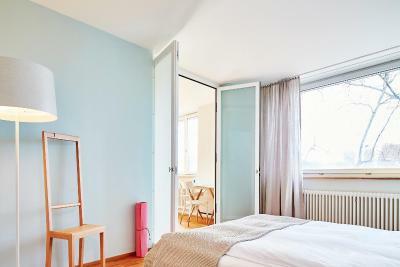 All children under 16 years are charged CHF 30 per night for extra beds. Any additional older children or adults are charged CHF 30 per night for extra beds. Greulich Design &amp; Lifestyle Hotel accepts these cards and reserves the right to temporarily hold an amount prior to arrival. Greulich Design & Lifestyle Hotel accepts these cards and reserves the right to temporarily hold an amount prior to arrival. I like the place AND the breakfast! Room was not completely dark at night, so I wore and eye-mask. There is an eye-mask provided in the room for those without their own. The frosted glass wall partition of the bathroom design and the shower faucet - once we figured it out it was great, but it was a small shower and my son managed to soak the entire bathroom trying to adjust the nozzle. Room needs some maintenance- Beside table lamp on/of cord broken and all that remains is well used frayed remnant. Room door catches. need body weight to force open and closed. Not the only door in the hotel to suffer 'maintenance need'. Cleaning staff almost force themselves into room when it suits them to clean. Room amenities minimal for 4 star hotel. Needs a management review to maintain 4* expectation. They were really great with my dog. Cool place! 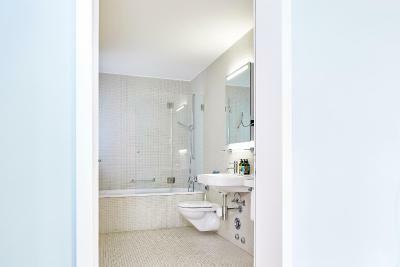 The apartment size, the facilities within the apartment and the location. It would be nice to have different pillow options (the room had soft down pillows, which some people find uncomfortable). Also, we booked breakfast, but were not informed that we should make a reservation (maybe this only applies on Sunday mornings, but it was very busy and they almost didn't have room for us). Very cool property. Has an onsite yoga studio, overlooking a grove of trees. The hotel layout was cool as well. The room was well laid out, with nice extra touches like water, apples, coffee and tea in the room. The bed was comfy. Also a delicious Sunday morning brunch that seemed quite popular for neighbourhood residents as well as hotel guests. It got a little warm in the room and with the street noise leaving the windows open wasn't the best option but the fan helped. Didn't know in advance that my room would be on the ground floor. Shower was not that comfortable. An amazing location! The place was a pure delight and I really enjoyed it. Staff is extremely friendly and concerned, they made me feel welcome even though I arrived quite late. The place is beautiful and so convenient. I was happily surprised by the size of the big bath - so relaxing! Drop by the yoga studio if you can. The hotel has some interesting outdoor space that could be used more effectively for guests' relaxation and enjoyment. Also, the bathrooms are not very private: good for couples but awkward with friends.